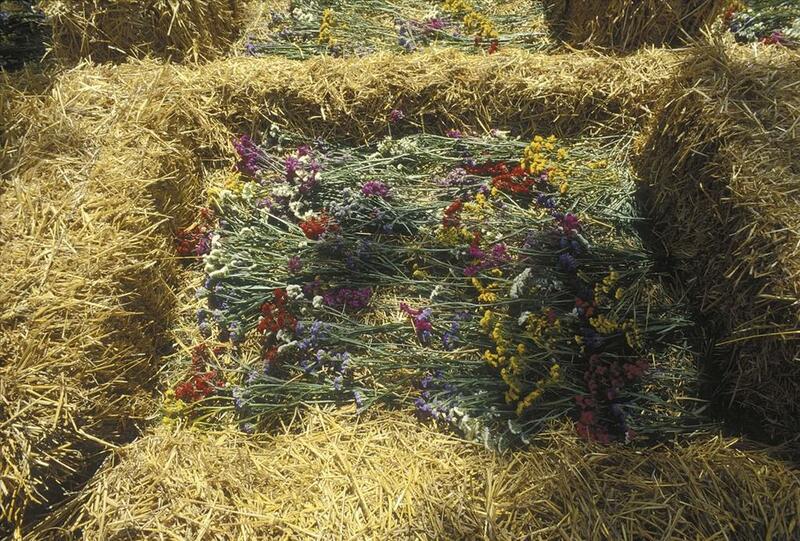 Materials: hay, stone and flower. Dimensions: m 4,5 x 52 x h 0,54. Shanti, peace understood as the inescapable condition of joy, fruit of the way of wisdom and of intense spirituality: this is the profound meaning of the Maria Dompè’s installation in the green space that separates the old convent from the new building of the sanctuary of San Gabriele. 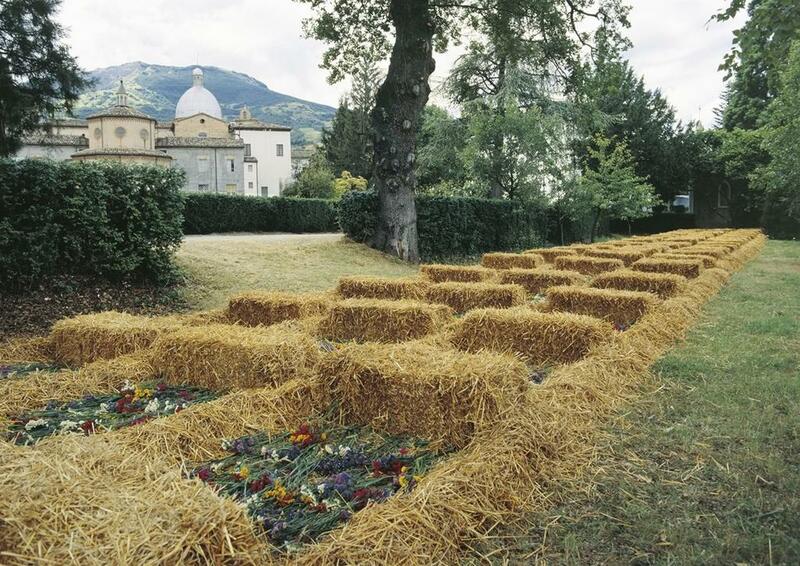 A garden in a garden, a ‘hortus conclusus’, a visual path that guides the visitor’s glance towards the votive niche at the foot of which there are bails of hay that arrest our sight. The stones in beginning their journey - almost a signature - echo the imposing mass of the Maiella, a mountain, that is behind the visitors, and together become an invitation to stop, underlining the mental pause that characterizes Maria Dompè’s installation. 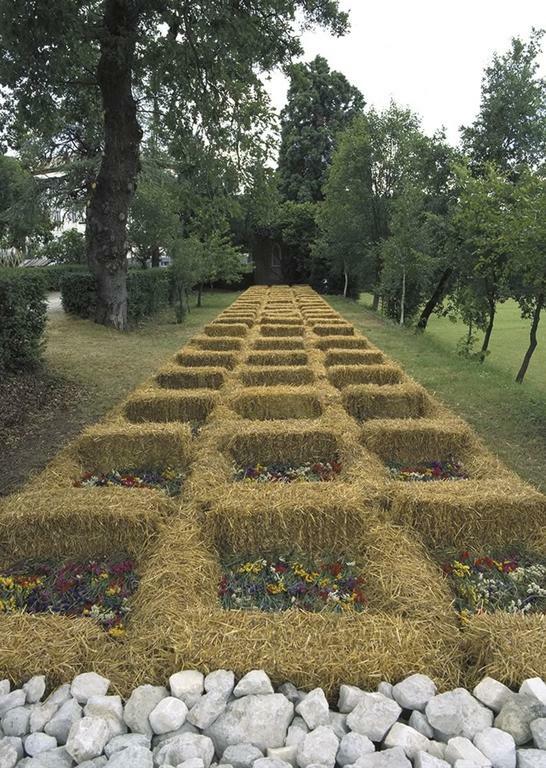 The work appears therefore as a moment of intimate reflection and of joyous peace, enhanced by the flowers and the intensely summer-like perfume of the hay and of the numerous flowers: orderly placed inside of a luminous grill of hay, as if they were gently placed inside of pools, the small flowers emphasize by their spatial orientation the slow and disciplined movement of the eye.